Cold hardy to -10 F.
Giant Leaf Bamboo has some unique properties. First of all are the giant leaves, up to 24 inches long and 4 inches wide. It will grow in almost complete shade and is extremely cold hardy, surviving and staying green down to about -10F. The slender canes arch over forming a sort of mound of bamboo. 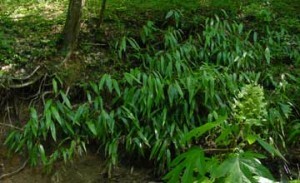 In the picture above, Giant Leaf bamboo has been planted in a bend of our creek. This is in the woods and gets little if any sun. Before the planting the creek had eroded the sides and this was a bank of red clay that was only getting worse. I planted several pieces of I. tessalatus in the creek bank and in only a few years it had spread and covered the entire area. It has worked better than I expected, especially since it gets so little (or no) sun.